Interview with philosopher and activist Srecko Horvat about #DeleteFacebook, global communities and our relationship with social media. On a cold February morning in 2008, hundreds of people turned up outside the Church of Scientology building in New York. They carried placards and every single one of them wore a threatening mask – most noticeably the Guy Fawkes mask from the V for Vendetta movie. They were members of the messaging board 4chan, ostentatiously there to protest Scientology. But mostly, they just wanted to see what would happen. Could a community that so far had only existed on the internet go mainstream and make an impact in the real world? Turns out, it could. For the last ten years, organizing any kind of protest without the internet and social media has been unthinkable. The Guy Fawkes mask reappeared at sit-ins organized by the Occupy movement and became the symbol of Anonymous, the hackers collective. In 2011, Facebook and YouTube fanned the flames under the uprisings in the Arab world. In 2016, #Ferguson became Twitter’s most used hashtag representing a social cause ever, at 22,7 million mentions – followed on the heels by #BlackLivesMatter. Demonstrations against gun violence in America were organized all around the world in 2018, using #NeverAgain and #Marchforourlives. At the same time, the relationship between social media and activism is an uncomfortable one. Much has been written about ‘slacktivism’ or hashtag activism; people supporting a cause by liking something on Facebook or signing an online petition but not actually taking action. Another potential problem is the difference in values between the corporations behind social media, and the protest movements themselves. Can you still believably use Facebook to reach people when you’re protesting against the excesses of capitalism, or in defense of online privacy? Even when you know the social network has leaked personal data from 87 million users to political advertising company Cambridge Analytica, which used the data to campaign for Brexit and Donald Trump? We asked philosopher and left-wing activist Srecko Horvat (Croatia, 1983) what he makes of this dilemma - and how he sees the future of social media protesting unfolding. Horvat has been writing for years about the demonstrations that have made international headlines, like Occupy and the protests at the G20 in Hamburg. He is also deeply interested in technology: Tinder helped inspire his philosophical book The Radicality of Love, and he has often spoken in defense of Julian Assange. Horvat is critical of capitalism and an advocate of direct democracy. Currently he is on the road campaigning for the Democracy in Europe Movement (DiEM25), the platform he co-founded alongside Yanis Varoufakis. Were you concerned about the recent revelations concerning Facebook? Did you delete your account? ‘Luckily I’ve never had a Facebook account, so I’m not in the traumatic position of the millions who feel addicted to Facebook (see: “I’m angry at Facebook- but I’m also addicted. How do I break free?”) Such a column is reality now, not a line from a science-fiction movie like “The Circle”. Why do you think Facebook’s impact on society is negative? But back in 2011 Facebook got a lot of credit for its role in the Arab Spring uprisings. Have we become too cynical or disillusioned about the internet’s revolutionary potential? ‘Yes, during the so-called “Arab Spring”, technology had a decisive role. But let us not forget that during the height of the Egyptian uprising and occupation of Tahrir square, the Mubarak government, in partnership with Vodafone, cut off telecommunications, depriving demonstrators from using their mobile phones and Twitter services. More recently, the UN’s fact-finding mission in Myanmar declared that social media had “substantively contributed to the level of acrimony, dissention, and conflict” in that country. So you can see that “social media" can both be used for emancipation and for conflict. ‘There is a long tradition in philosophy, from Plato to Derrida, and most recently Bernard Stiegler that understands technology as “pharmakon”, an ancient Greek term which designates both a remedy and a poison. The point is not to fall into the trap of viewing it as either/or; technology is both a remedy and poison, at the same time. Some people have argued that if we delete our social media accounts for privacy reasons we are robbing ourselves of the best tool we have to organize protests and petitions and make smaller movements visible for free. What would you say to them? At the Brainwash festival in Amsterdam last year, you said the only way to save the world is by building something that is worth losing - a truly global community. Is it possible to achieve the dream of building a global community without companies like Facebook? After all, ‘building the global community’ is literally what they say their mission is. ‘To answer your question, I would pose the question without a negation: is it possible to achieve the goal of building a global community with companies such as Facebook? After the Facebook revelations, I hope even a fool knows that it is precisely with companies like Facebook that it is difficult not only to build, but to imagine a different world. If you want a world in which narcissism and fake friendships reign, choose Facebook. If Big Tech is here to stay, how should we deal with it? Is it a problem for your ambitions with DiEM25? ‘It is a major challenge, not only for DiEM25, but for all of us. I don’t believe preemptively that any struggle is destined to fail. But if we are not quick and successful, the question will be whether it will still be possible to lead any struggles against the final privatisation of the General Intellect. What will happen if even resistance becomes preprogrammed? Has social media made this generation lazy when it comes to protesting against perceived injustice? On Twitter you called the current Facebook scandal a ‘small footnote’ to a ‘deeper AI-driven transformation of politics’. What do you think AI will mean for the future of politics? You might say the algorithm is already deciding for us. Didn’t we see it with Trump’s victory and Brexit? What advice would you give to young Europeans today? Support independent, cross-border journalism with as much as a single euro. 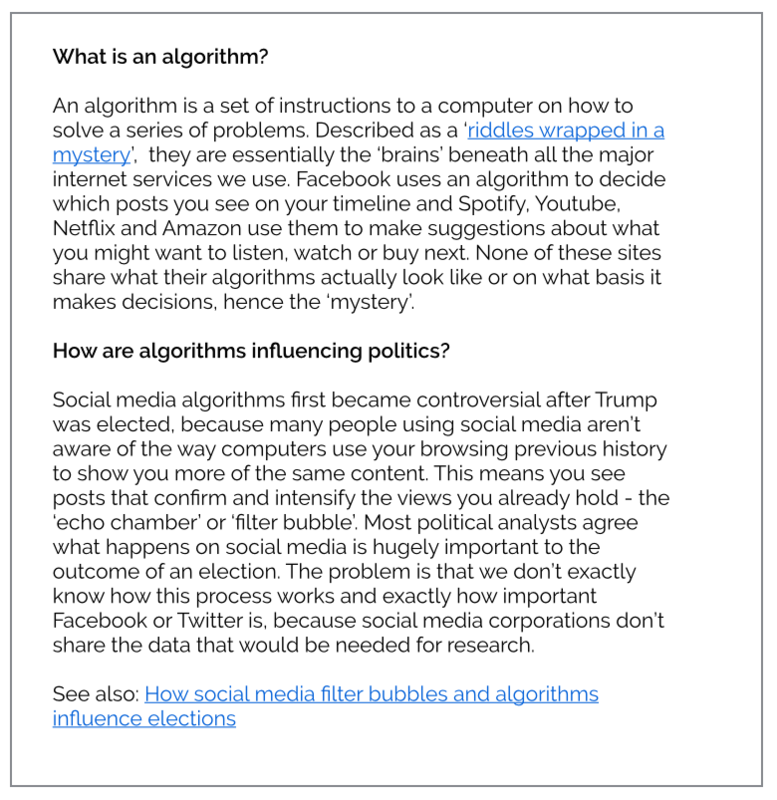 What are algorithms and how do they influence politics?